The following is an excerpt from “The PR Fix for the Everyday Person” © 2014 by Jenny Fujita and Joy Miura Koerte. A lot of people wave away gifts in all of their forms, from presents to awards, compliments and prizes. It may not even be because they don’t like or want the gift, but the it may make them feel embarrassed to receive the gesture or boastful if they accept a compliment. You probably know people like this. You may have even been one of them on occasion. We all have. Your child is calling for you, “Mommy! Mommy! Come here! I have something for you!” You unenthusiastically respond, “I’ll be there in a minute,” because you’re in the middle of something and another distraction will drive you batty. Or, the cashier in the grocery store says, “Lovely outfit.” You respond quietly, “It’s really old.” The postmaster offers you a free lollipop. You say, “No thanks” and scoot to your car in a hurry. And so on. The thing about all of these situations is that they are deflating for the giver. It shuts them down. It also hampers any further interaction between you and them and that’s a shame because positive interactions are always worth the time. Look at it from the giver’s perspective. How does the child feel when the parent doesn’t have time to receive a gift she has made herself? How does the cashier feel when the outfit she says is lovely is qualified as “really old?” Or the postmaster who kindly offers you a treat that you won’t take? Let’s rewind and look at these situations from a different angle. “Mommy! Mommy! Come here! I have something for you!” You respond, “Oh boy! Give me two minutes and I will be right there. I can’t wait!” And then you finish or pause what you’re doing and go to your child to receive your wonderful gift. “Wow, Sweetheart! This is awesome! Thank you!” you say and you see her proud smile. Love and hugs ensue. Now you’re at the grocery store. “Lovely outfit,” says the cashier. “Thank you! I’ve had it such a long time. It’s been used well.” The cashier smiles and says, “I have a coat like that. I just can’t give it up. It’s old but I get compliments on it all the time.” You say, “Sometimes old things are the best.” You pay your bill and say, “Thanks,” and when she says, “Have a great day,” she means it because you’ve connected with each other. At the post office, the postmaster offers you the lollipop. “How sweet!” you declare. He chuckles and you wave goodbye to each other. You made his day with your little joke. Inject some enthusiasm into all of your interactions, especially when it’s your chance to receive a gift of any kind. It will pay off, literally, in both obvious and profound ways. When you’re truly open to gifts and in receiving mode, more of them magically come to you. And, when you give someone the joy of giving, they feel akin to you on a much deeper level than if you had dismissed their gift. 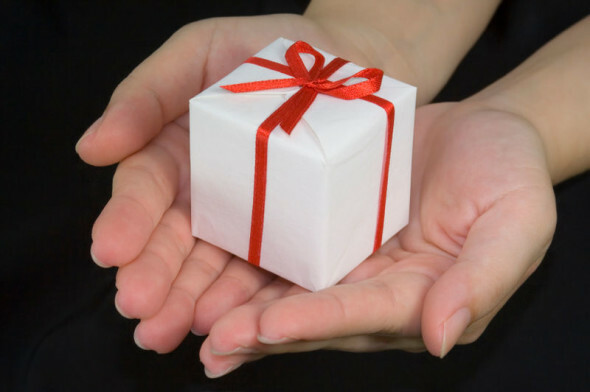 Giving and receiving are symbiotic and together, they breed happiness.